Shooting Fundamentals: Mechanical Offset | Eagle Gun Range Inc. The fact that you must zero your rifles and pistols is a result of the fact that you aim with sights or optics that are some distance above the center bore of your barrel. The spatial difference between the two is known as mechanical offset. 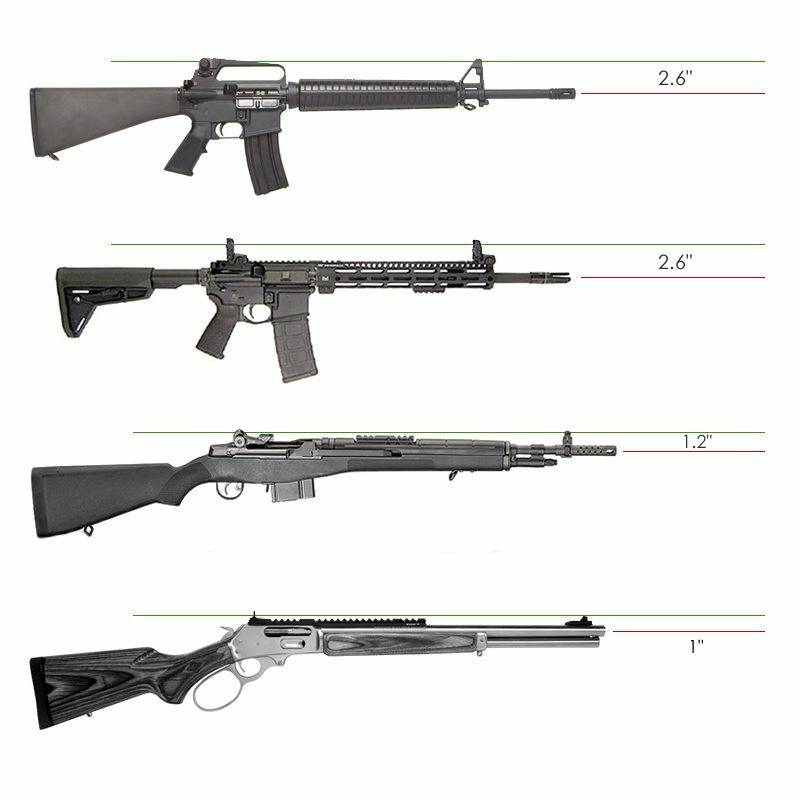 Mechanical offset varies from firearm to firearm, but for rifles is generally 1” to 3” and for pistols is generally 5/8” to 3/4”. 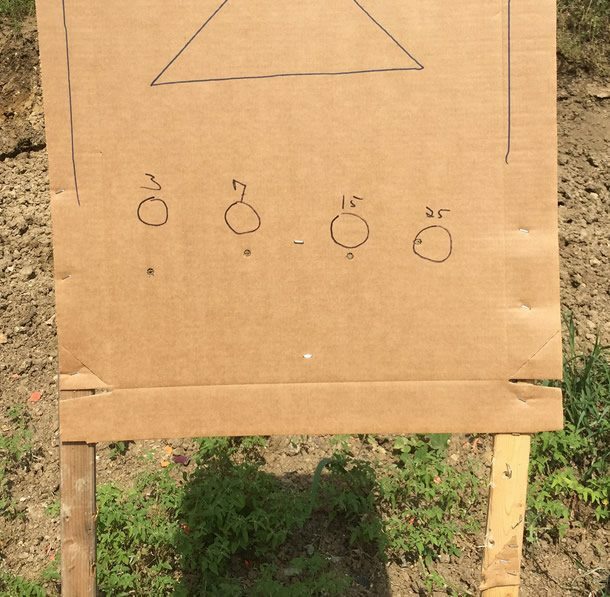 Unless your pistol has an elevation adjustment (almost none do), it is likely zeroed at 25 yards, though you may still have to adjust windage for zero. 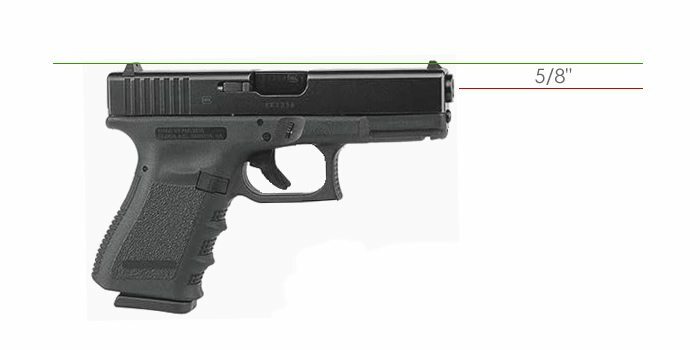 Even so, a pistol’s relatively low mechanical offset allows hits at 3 to 7 yards to be quite close to your point of aim. In certain situations, however, there can be significant targeting consequences even for pistols when mechanical offset is not properly accounted for, as we’ll examine in a moment. Above: I took these shots with my .308 AR rifle (L to R) from 3 yards, 7 yards, 15 yards and 25 yards, using iron sights and aiming dead center on each circle. The rifle is zeroed at 25 yards (giving it roughly a 265-yard zero, too, depending on projectile grain weight) so it shoots well low at 3 and 7 yards, a bit low at 15, and dead on at 25 yards (a little left here resulting from a quick shot). The variances here show the difference between the bullet’s vector and my point of aim, as affected by the distance. If you’re not familiar with or haven’t considered the physics involved in zeroing a rifle, the above example demonstrates that while your point of aim is dead-center for each circle, the fired projectile begins some measure below your line of sight and, due to the descending line created by your sights or optic, travels on an upward vector to eventually meet your point of aim (your zero) at a determined point downrange. Therefore, if you want to hit where you desire to hit at close range, you must learn to automatically compensate for mechanical offset based on the range from which you are firing. It’s not generally necessary that you learn the precise mechanical offset for your rifle sights, so long as you know and verify your zero. 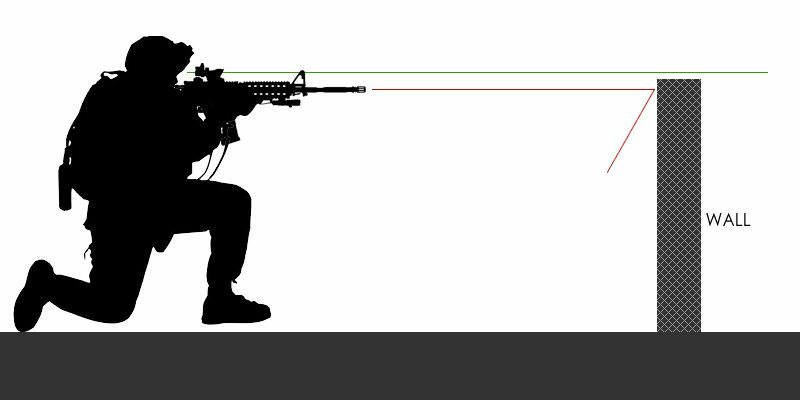 However, knowing the mechanical offset can be very important for long-range shooting with an optic AND when shooting at close range, as we’ll examine next. Some years ago there was a situation where man was holding a woman hostage on a sidewalk at the entrance to a city shop. He had one arm around his hostage and was holding a knife to her throat. Police had responded and while a negotiator further down the sidewalk was talking to the man, another officer with a carbine took up a position about 25 yards away, across the street and behind a short wall. With this cover, the assailant had not seen him and so the officer believed he had a clear shot at the man with the knife. The officer took steady aim and pressed off a shot, which impacted the wall that was about 5 yards in front of him. So here the officer had a good sight picture, but he forgot to account for mechanical offset, rendering his shot useless. Then, realizing his mistake, he added elevation to his position to clear the wall and was able to dispatch the knife-wielding assailant with his next shot. The officer’s initial mistake could have caused the assailant to respond violently against the hostage. In this case, the officer and the hostage got lucky. We should not get into the habit of trusting to luck and instead should learn to properly account for mechanical offset. 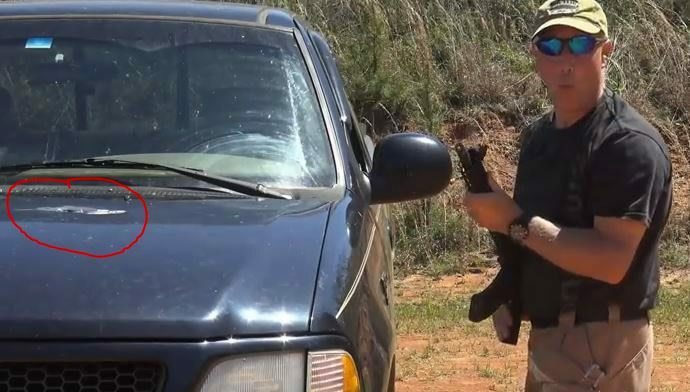 Yet another more recent example comes from a popular Youtube channel personality who shot up his truck when training with his AK/AR mutant rifle. 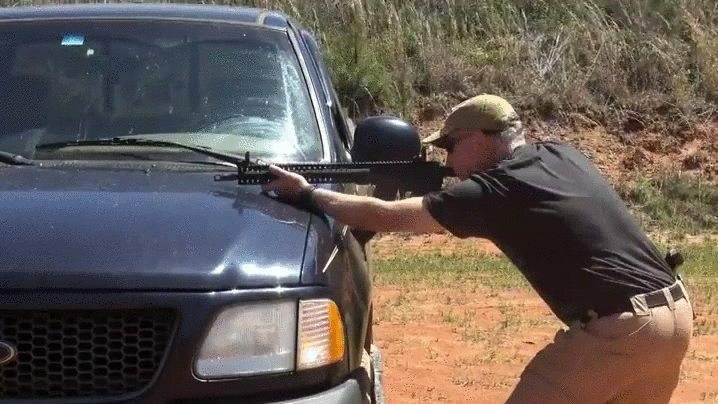 He took clear aim at his target, using the hood of his truck for stability, but didn’t notice that his bore axis was running straight into the hood. He got a rude awakening and a tidy body-shop bill for his negligence (there was a video of this, but he has since taken it down). I don’t mean to ridicule the man here, but instead use his example as a lesson for all of us. Mechanical offset matters and sometimes matters greatly. Even though a pistol has quite a small mechanical offset as compared to a rifle, it is still there and still matters. 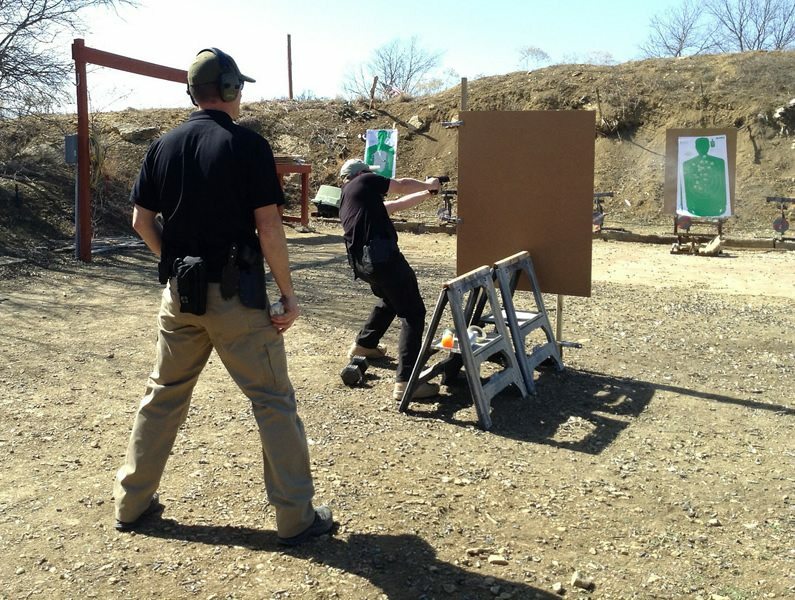 When working barrier drills it is vital that you account for the difference in your point of aim and point of impact on things close to you, especially if you angle your pistol to clear the cover. 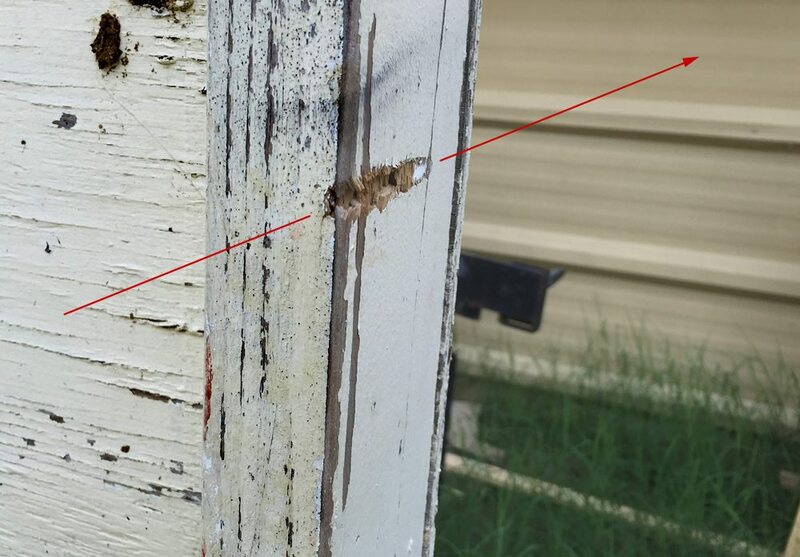 Below: Here’s an example of where someone leaned out to shoot a target from behind this wooden barrier, had a clear sight picture, but didn’t account for the small mechanical offset with their pistol. The round caught the edge of the barrier, creating a furrow. You can solve this issue by keeping your pistol vertically aligned or by training to make proper mechanical-offset clearance habitual. Above: Just this small measure of mechanical offset can turn an otherwise good shot into a property-damaging or even injurious mishap. Learn your tools and how to use them! Hopefully your training involves contexts where mechanical offset becomes important. 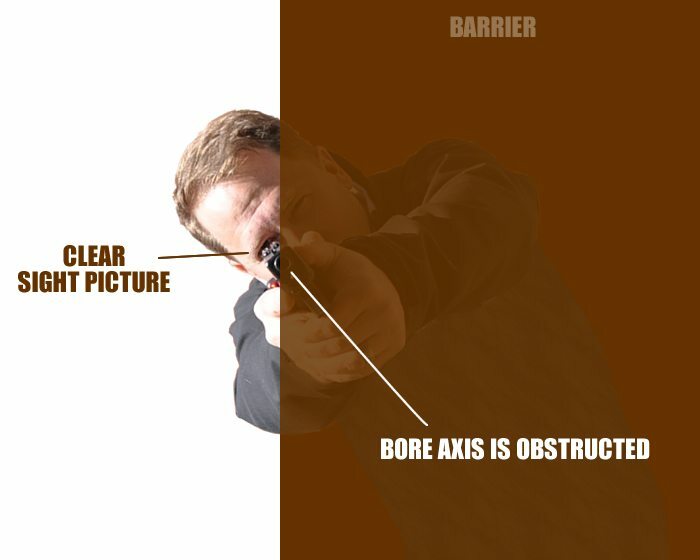 If not, work to introduce barriers, cover, and varied-range targets. 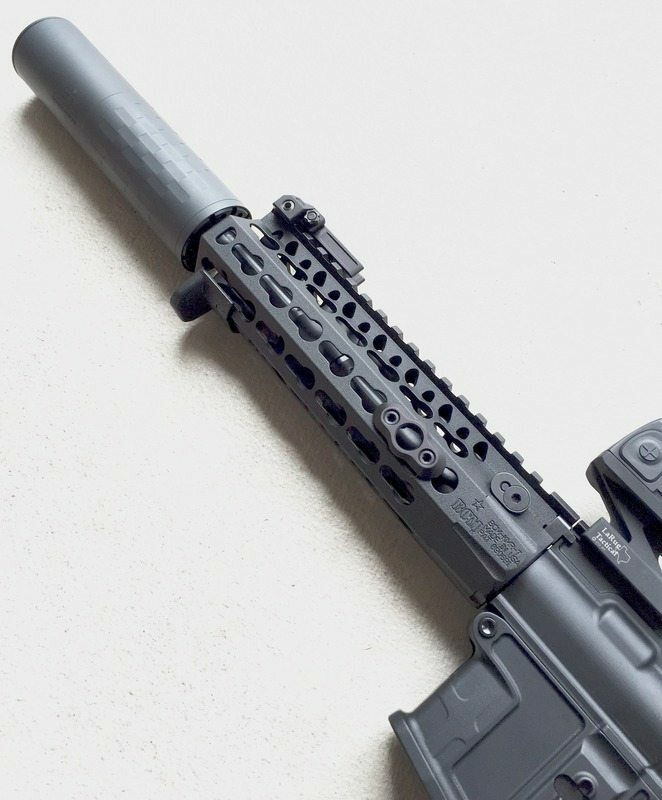 Learn the necessary compensations for mechanical offset with each of your firearms and verify them often. Great article, one of the best Ive read on a common, yet rarely thought about problem. Great Article. Great Information. More Please. Thanks.